Blue Flag Root Medicinal Properties and Growth Habitat. Blue flag, also called Dragon Flower and Water Flag, is a semi-aquatic perennial native to eastern and central North America. Like other members of the iris family, blue flag produces long, sword-shaped leaves and showy blue flowers. The root is jointed, with rings that mark the annual growth of leaves and root runners. Blue flag root contains several active compounds, including salicylic acid and a bitter oleoresin. The dried root is used to make tinctures and infusions for topical use. Blue flag, an herbaceous perennial of the ridaceae family, resembles a common garden iris and is often confused with Sweet Flag, which is another plant in another genus. Blue flag is a marginal aquatic plant that forms a clump of narrow, arching-to-erect, sword-shaped, blue-green leaves (to 24" long and 1" wide). Flowering stalks rise from the clump to 30" tall in late spring, typically producing 3-5 violet-blue flowers per stalk. Flowers have white and yellow markings at the sepal bases. Clumps spread slowly and naturalize by tough, creeping rhizomes. 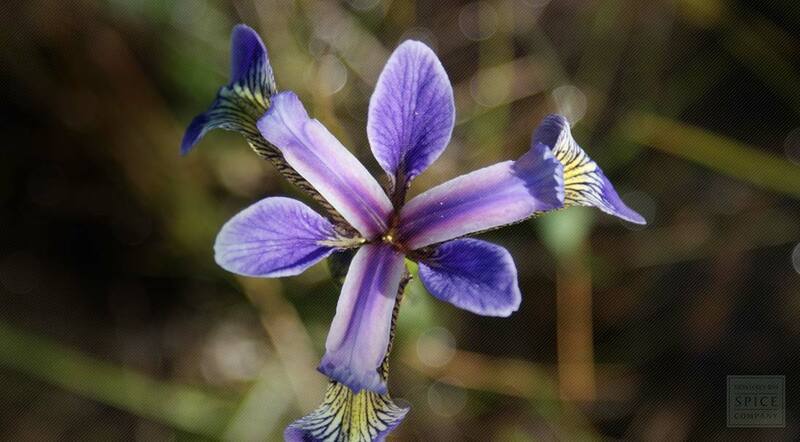 In Greek mythology Iris—Greek for "rainbow"—was the goddess of the rainbow and messenger of the gods. While versicolor, which means "having many colors" is in allusion to the prismatic colors of the species. 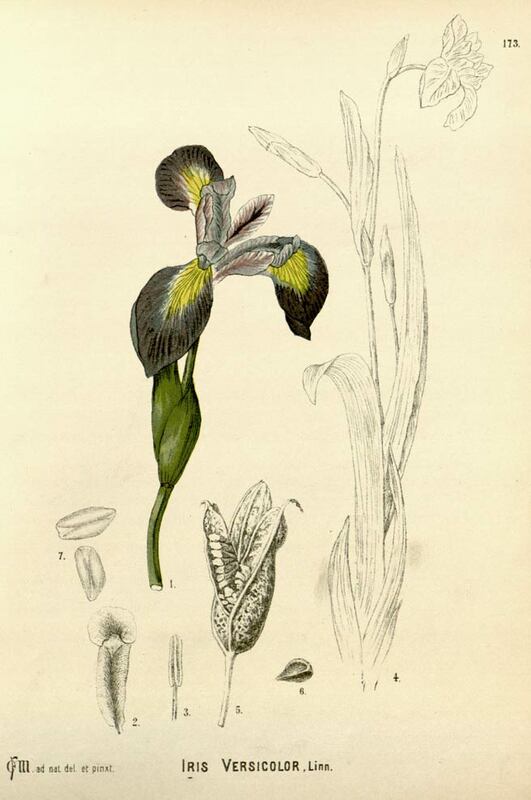 Iris versicolor is native to North America. It grows from Manitoba to Nova Scotia south to Virginia, Ohio, Illinois and Minnesota. Blue flag grows in sedge meadows, marshes, and along stream banks and shores in full sun to part shade. Grows in medium to wet soils, can be grown in shallow standing water. Propagate by division after the plant blooms. Wear gloves when dividing the rhizomes as sap may irritate skin. After fall frost, the plant leaves may be trimmed back to about 1" above the crown. Blue flag will naturalize to form colonies in the wild. If planted in August or September, it can be harvested at the end of October the following year. Wear gloves to dig out rhizomes, shake of excess soil, wash if needed, allow to dry completely. Once dried all the way through, the rhizome can then be cut into small pieces. Store in a cool, dry place in an airtight container. The fresh rhizome of Blue Flag is poisonous. Gloves are necessary for harvesting. Do not ingest fresh rhizome. Blue flag, or Iris versicolor, is a perennial wild iris indigenous to eastern North America named after the Greek goddess of the rainbow. The plant looks very similar to the common garden-variety iris except that the flowers, which are a vivid bright blue, are slightly smaller. Blue flag is known by many other common names that reflect its historical significance. Since early European settlers thought the plant closely resembled its European cousin, which inspired the design of the official emblem of French royalty, blue flag is sometimes called fleur-de-lis. Other common names include snake lily and water lily, a reference to the plant’s ability to thrive in shallow water.